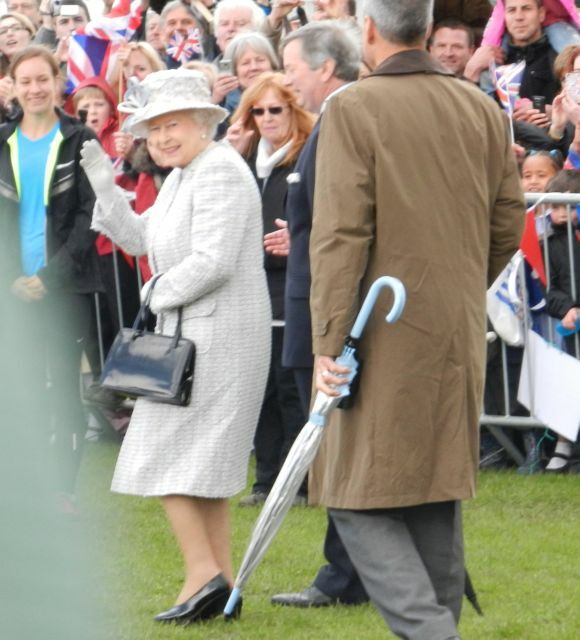 Yesterday, the Queen and the Duke of Edinburgh came to Richmond Park as part of their Diamond Jubilee Tour. I managed to place myself in the BEST spot at the front of the barrier - their car drew up right beside me and she got out on my side of the car and greeted someone in front of me on her side of the barrier. I stood next to Sir David Attenborough, who was also there to meet her. Sadly, it poured with rain just before she arrived and then again during her tour and viewing of the Royal Ballet School performance - it certainly didn't dampen our spirits but it seemed to turn part of the Park into a mud bath. I stood right beside their car in order to get another good view of them when they left. Many people had already left at this point thinking that they had seen everything. As their car pulled away, I waved madly at the Duke (whose side I was on now as the car had turned around) running along side their vehicle. I suddenly forgot my age and felt about 8 years old running along the platform of a train station. He wound down his window and we were eye to eye. He waved madly back at me. Nobody else was around me - clearly the homemade Jubilee cupcake I had eaten earlier had increased my blood sugar a considerable amount and provided a serious energy boost that enabled me to suddenly wave so madly and run along the barrier keeping up with the car - nobody else had obviously had the same cake as me as they weren't running with me! This was a once in a life time opportunity. Never again will I be able to be so close to the head of the Royal Family, the head of this country and other parts of the world - two of the most important and honourable people on Earth. Yesterday's visit to Richmond from the Queen was relatively intimate - there was quite a crowd (mostly school children) but not as many people were there as I have seen on other occasions. I came away feeling uplifted, honoured and so lucky to have seen the Queen in real life, something I have never done before. Having said that, when the Queen was celebrating her Golden Jubilee in 2002, she came to Ipswich (my hometown) on tour with the Duke, and I got close enough to nearly shake hands with the Duke of Edinburgh. The lady in front of me on that occasion beat me to it. I was only 11 then and not old enough to push my way to the front like I did yesterday. I also feel patriotic and proud to be British. I spent the rest of the afternoon with my Great Aunt whose late husband Norman Hepple actually painted the Queen and other members of the Royal Family on a few occasions.